Jubilant scenes in the Indonesian capital city of Jakarta; on Monday 27th August, India won its first ever medal in the table tennis events at the Asian Games. Moreover, Sathiyan Gnanasekaran became a national hero. A wait of 60 years came to an end; table tennis was first staged in 1958 when somewhat ironically, the host city was Tokyo. Facing Japan, the no.2 seeds; at the quarter-final stage of the Men’s Team event, a three-one win was recorded; in Jakarta a penultimate round place secures a bronze medal. Sathiyan Gnanasekaran gave India a dream start. He beat Jin Ueda in the opening match of the fixture (11-9, 11-9, 11-7), before Sharath Kamal Achanta doubled the advantage by overcoming Kenta Matsudaira (11-8, 12-10, 11-8). Masaki Yoshida reduced the deficit by defeating Harmeet Desai in five games (9-11, 14-12, 8-11, 11-8, 11-4), prior to Sathiyan Gnanasekaran sending the sub-continent into sheer delirium. He accounted for Kenta Matsudaira in four games (12-10, 6-11, 11-7, 11-4). Sathiyan Gnanasekaran, the hero of the hour for India, who had started play as the no.6 seeds; for Korea Republic, the no.3 seeds, against DPR Korea, the no.8 seeds, that accolade belonged to Jeoung Youngsik. He remained unbeaten in a full distance three-two success. He overcame both Pak Sin Hyok (11-7, 14-12, 11-7) and in the vital fifth match of the encounter An Ji Song (8-11, 11-4, 11-6, 11-6), on what was not a good day for Lee Sangsu. He lost to both An Ji Song (11-8, 11-9, 4-11, 7-11, 11-9) and Pak Sin Hyok (11-6, 11-7, 6-11, 13-11). The one further win for Korea Republic was secured by Jang Woojin; in the third match of the fixture, he accounted for Ham Yu Song (11-4, 11-7, 11-7). Exacting contests, in the two remaining quarter-final duels, life was less dramatic. China, the top seeds, with Fan Zhendong, Lin Gaoyuan and Liang Jingkun on duty recorded a three-nil win against the no.5 seeds, Hong Kong represented by Ho Kwan Kit, Wong Chun Ting and Lam Siu Hang. 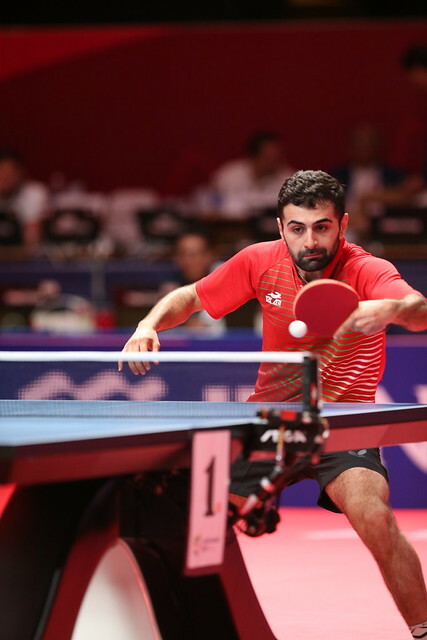 Similarly, Chinese Taipei, the no.4 seeds who fielded Chen Chien-An, Chuang Chih-Yuan and Lin Yun-Ju showed no charity when facing the no.7 seeds, Iran’s Noshad Alamiyan, Nima Alamian and Amin Ahmadian; a three-nil win was the outcome. At the semi-final stage China meets Chinese Taipei, Korea Republic opposes India; both penultimate round contests and finals will be played on Wednesday 28th August.